iDecal App by WALLTAT Is Available On iTunes! 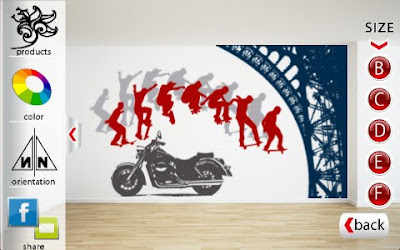 iDecal is a FREE app that let’s you create your own WALLTAT from photos, design a wall with WALLTAT wall decals and share your creations via Facebook and e-mail. 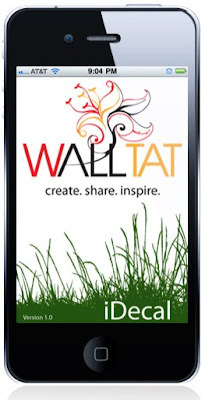 This exciting app is a powerful visualization tool that brings the world of WALLTAT Wall Decals into the palm of your hand. iDecal allows you to virtually apply WALLTAT Wall Decals to a wall in your own home or to a stock wall in the room scene library. 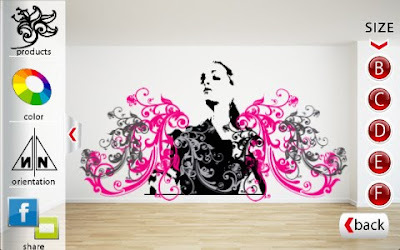 It also allows you to create custom WALLTAT Wall Decals from new or existing photos on your iPhone, iPod touch, and iPad. Ever wonder what you would look like as a WALLTAT? iDecal lets you do just that. WALLTAT any image with the tap of the “WALLTAT IT!” button. WALLTAT anything from your friends and pets to drawings and objects and customize your designs with our simple toolbar that includes crop, size, orientation and 34 color options. 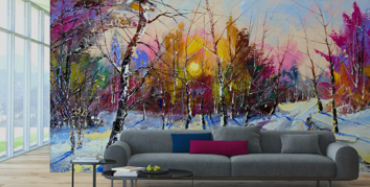 Visually transform your space by taking a picture of your wall and preview a wide array of designs to create the perfect WALLTAT mural for you. Combine multiple stock designs and custom creations on a single screen and preview them in different colors, sizes and orientation. Once you are happy with your design, share it with your friends via Facebook or email, and inspire them to create their own. Upload your image and then hit the "WALLTAT IT" button. (white backgrounds offer best results). Adjust the slide bar to attain your desired level of detail and voila! Save your creation and be prompted to input the width that you'd like your decal to be saved as . And just like that, you've created a custom WALLTAT! Now that your creation is saved, you can snap a photo of your wall to preview on, or use one of the stock walls that is made available. Grab your custom creation and change its color or orientation. Add in additional custom designs or stock products from the WALLTAT collection. Facebook or email your final piece of artwork for everyone to see. Email it to WALLTAT for a quote and have it manufactured. Ordering custom wall decals has never been so easy! The WALLTAT Products library allows you to preview stock designs in 34 color options and over 1000 background color options. This is the perfect tool for visualizing the color of your painted wall with our customized wall decals. Once you are happy with your options, click the “Buy it Now” button to go directly to the product page at our online store. iDecal is an indispensable tool for all-ages, and especially interior designers and architects working in the field. Help your clients visualize their space with your custom WALLTAT creation or one of our stock designs. 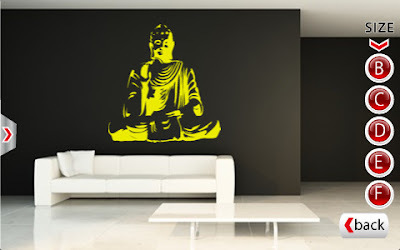 Wall art is no longer limited to the frame and this unique wall décor solution can be incorporated into any design project, residential or commercial. iDecal also connects to the WALLTAT mobile website that makes browsing and shopping easy on mobile devices. It also lets you connect with WALLTAT via Facebook, Twitter and Blogger for up to date news and information on WALLTAT Wall Decals. Explore the infinite possibilities for yourself by downloading the Free iDecal app today!